Abstract: The antiseizure efficacy and safety of levetiracetam (LEV) is well documented; however, few clinical studies have investigated the predictability of patient responsiveness to LEV, especially when the drug is first administered. The aim of this study was to ascertain the utility of clinical, electrophysiological, and neuroimaging parameters for assessing the early response to LEV treatment in focal epilepsy patients. Twelve confirmed focal epilepsy patients were included who had never taken LEV before. At baseline and 1 month after LEV administration, all subjects underwent 18F-fluorodeoxyglucose positron emission tomography (FDG-PET) and electroencephalography (EEG), and completed the Quality of Life in Epilepsy questionnaire (QOLIE-31). Participants were divided by drug response: good versus poor. The good response group (seven subjects) was defined by a >50% decrease in seizure frequency compared to baseline (3 months before LEV intake). The other five participants with a <50% decrease in seizure frequency were placed into the poor response group. We compared the differential changes in brain glucose metabolism on FDG-PET, power spectrum on the EEG, and QOLIE-31 results between the two groups after a 1-month LEV trial. In the good response group, it was possible to identify brain regions with increased glucose metabolism, including the bilateral caudate nuclei and both frontal and left parietal regions (uncorrected P<0.005). In the poor response group, FDG-PET did not reveal any areas with significantly increased glucose metabolism. In the good response group, spectral EEG analysis revealed decreased delta power (1–3 Hz, P<0.05) in the parietal region and increased beta1 power (13–19 Hz, P<0.05) in the frontal region, whereas no significant changes were observed in the poor response group. There were no significant changes on the QOLIE-31 in either group after a 1-month LEV trial. Our results suggest that LEV-induced glucose metabolism and EEG spectral changes may be indicative of initial drug responsiveness as early as 1 month following treatment initiation. These parameters may be useful prognostic markers of antiseizure effects caused by LEV medication or may indicate an epiphenomenon of LEV-induced changes in glucose metabolism and EEG frequency. Further studies with larger sample sizes are warranted. Antiepileptic drugs (AEDs) are the primary treatment option for controlling seizures in epilepsy patients, but they can also impair cerebral metabolism and cognitive performance. AEDs inhibit neuronal excitability, enhance inhibitory neuron activity, and alter neurochemical systems in the brain.1 The preferred method with which to examine the effects of AEDs on cognitive function has been neuropsychological testing, but these types of tests have several limitations including practice effects and test–retest variability.1–3 However, measures of cerebral glucose metabolism and quantitative electroencephalogram (EEG) can provide additional insight into the effects of AEDs on cognitive function. EEG is highly sensitive to an individual’s cognitive function and can provide information about alertness. Many published studies have investigated the influence of cognitive function on EEG results.7,8 In EEG frequency domain analysis, the power of each band can serve as an important indicator of cerebral activity.9,10 Some AEDs affect the frequency characteristics of an ongoing EEG.11 In addition, the current-source analysis of digital EEG data can be used to directly measure neuronal activity and identify the approximate location of current sources. Old AEDs can have negative effects on cerebral glucose metabolism and background EEGs.11,12 Some new AEDs such as levetiracetam (LEV) and lamotrigine result in less severe cognitive adverse effects compared with older AEDs.1,13 LEV also has multiple antiepileptic mechanisms and linear pharmacokinetics.14 LEV does not negatively influence cognitive function and may even improve it.15 EEG studies have reported that LEV has a positive effect on cerebral neuronal activity and cognitive function;16,17 however, these studies investigated only the long-term effects of LEV, and changes in cerebral glucose metabolism were not assessed. In this study, we investigated the influence of LEV on cerebral glucose metabolism and background EEG 1 month after beginning treatment. We also tried to identify meaningful differences between good and poor responders at an early stage of LEV administration. To evaluate the in vivo effect of LEV on cerebral glucose metabolism and background EEG, we recruited patients with focal epilepsy who had never taken LEV. 18F-fluorodeoxyglucose (FDG) positron emission tomography (PET) and EEG scans were performed at baseline and after 1 month of the medication regimen. Twenty-three patients with diagnosed focal epilepsy who had never taken LEV (allowed for LEV monotherapy or add-on therapy to one or two existing AEDs) were recruited from our epilepsy clinic between January 2010 and January 2012. This study was approved by the local ethics committee, and all patients provided written informed consent to participate in the study prior to the administration of LEV in accordance with the guidelines of St Mary’s Hospital in Seoul, Republic of Korea. Each patient received the same dosage of LEV for 1 month, which began with a titration period over the initial week (250 mg per day for the first 3 days and 250 mg twice daily for 4 days). After the first week, the LEV dose was increased to 500 mg twice daily and continued for 23 consecutive days, with two exceptions (patients 2 and 7 continued treatment for 28 days). On the first visit, enrolled patients were subjected to clinical examination (neurological exam, clinical history, seizure frequency, the Quality of Life in Epilepsy questionnaire [QOLIE-31], and Symptom Checklist-90 Revised [SCL-90-R]) and FDG PET and EEG acquisition, and LEV administration was subsequently initiated. One month after the initial assessment, the subjects returned for a follow-up visit to determine the initial therapeutic efficacy, incidence of adverse effects, and compliance during initial LEV treatment. After controlled administration of LEV (1,000 mg/day) during the first month, the dosage of LEV for each patient was adjusted freely according to the patient’s condition and continued for an additional 3 months. Four months after treatment initiation (on the third visit), the final LEV dosage, seizure frequency, incidence of adverse effects, and drug compliance were recorded. The participants were divided into two groups according to their LEV response 1 month after treatment initiation. The good response group included patients with >50% reduction in seizure frequency relative to the baseline seizure frequency (as assessed during the 3 months prior to commencing LEV treatment). Conversely, the poor response group was defined as having a decline in seizure frequency of <50%. FDG PET images were obtained at baseline and after 1 month of LEV administration using ECAT HR plus and Biograph scanners (Siemens Medical System, Inc, Hoffman Estates, IL, USA) while the subjects rested comfortably with their eyes closed and ears plugged in a darkened and quiet room. The patients were instructed to fast for at least 6 hours prior to the scans and were given an intravenous injection of FDG (7–10 mCi; 214.6–444 MBq). All PET scans were performed more than 24 hours after the patient’s last seizure. The images were reconstructed using ordered subset expectation maximization with 16 subsets and six iteration reconstruction algorithms (Shepp filter with a cut-off frequency of 0.5 cycles per projection element). The reconstructed PET images consisted of a 128×128 image matrix with a pixel size of 1.72×1.72 mm and an inter-slice distance of 2.43 mm. All FDG PET data were analyzed for any changes in specific regional glucose metabolism with Statistical Parametric Mapping (SPM) 8 (The Wellcome Trust Centre for Neuroimaging, Institute of Neurology, University College London, London, UK) in conjunction with MATLAB (Mathworks, Inc, Natick, MA, USA) software. The reconstructed PET data were reformatted into the Analyze format. A direct between-subjects statistical analysis was impossible because of the different shapes and sizes of the subjects’ brains. Therefore, the images obtained from each patient were spatially transformed to a generic SPM PET template to remove anatomical variability and then smoothed with a full width at half maximum 16 mm Gaussian kernel to increase the signal-to-noise ratio. Then, paired t-tests were used to perform group comparisons on the PET images before and after LEV use. The results were displayed on a healthy subject’s magnetic resonance imaging template after spatial normalization. EEG recordings were obtained before and after initiation of LEV medication. For each patient, EEG data were recorded for at least 30 minutes with a digital EEG machine (Nicolet Biomedical, Madison, WI, USA) at 250 Hz using 19 channels based on the international 10–20 system (Fp1, Fp2, F3, F4, C3, C4, P3, P4, F7, F8, T3, T4, T5, T6, O1, O2, Fz, Cz, and Pz). All EEG data were analyzed using standardized low-resolution brain electromagnetic tomography (sLORETA) in which 20 samplings of 2-second epochs with no epileptiform discharge and no artifacts were selected from segments of the waking state recordings. A sLORETA software package8 was used to analyze the following EEG frequency domains: delta (1–4 Hz), theta (4–8 Hz), alpha1 (8–10.5 Hz), alpha2 (10.5–13 Hz), beta1 (13–22 Hz), and beta2 (22–30 Hz). The sLORETA employed a three-spherical head model based on the Montreal Neurological Institute 152 template18 with the three-dimensional solution space restricted to cortical gray matter, as determined by the probabilistic Talairach atlas.19 The standard electrode positions on the Montreal Neurological Institute 152 scalp were obtained from a previous study,20 and the sLORETA solution space consisted of 6,239 voxels at a 5 mm spatial resolution in the three-dimensional plane. The power current density for each voxel was normalized by averaging the power current density across all voxels and all frequencies. All statistical analyses comparing the two groups were performed using SPSS software (version 12.0 for windows; SPSS Inc, Chicago, IL, USA), and all demographic variables were analyzed using either a Chi-square test, Fisher’s exact test, or Student’s t-test, as appropriate. Comparison of QOLIE-31 and SCL-90-R scores measured at baseline and after 1 month of LEV administration were performed using paired t-tests for the good and poor responder groups. At the end of the study, only 12 of the 23 patients recruited completed the full 4-month LEV treatment course and the pre- and posttreatment evaluations. Four participants dropped out due to noncompliance, two were excluded because of poor FDG PET image quality, and five patients discontinued LEV because of a lack of efficacy (three) or problems with tolerability (two). The good response group included seven patients (five females, two males; mean age, 40.4±15.7 years; baseline seizure frequency, 14.5±20.9 per month) and the poor response group included five patients (one female, four males; mean age, 37.2±10.6 years; baseline seizure frequency, 8.5±10.8 per month). The mean durations that patients had been affected by seizures were 12.9±13.7 years and 6.8±6.7 years in the good and poor responder groups, respectively. There were no statistically significant differences between the groups for any of these variables (Table 1). Note: *Seizure frequency during the last 3 months prior to LEV administration. Abbreviations: AEDs, antiepileptic drugs; Avg, average; B, bilateral; Dx, diagnosis; FLE, frontal lobe epilepsy; G, patient of good response group; L, left; LEV, levetiracetam; P, patient of poor response group; PLE, parietal lobe epilepsy; R, right; TLE, temporal lobe epilepsy. Of the 12 patients, five (41.7%) achieved a seizure-free state with 1,000 mg/day 1 month after initiating LEV treatment. Patients 1 and 7 showed a >50% seizure reduction during this period. Moreover, among the seven patients in the good response group, three (42.9%) remained in a seizure-free state throughout the subsequent 3 months. However, three of the five patients (60%) in the poor response group exhibited seizure aggravation in the first month after LEV treatment initiation. After dosage adjustment, three patients showed a 50% decrease in seizure frequency. Age, age at seizure onset, epilepsy duration, baseline seizure frequency, and number of concomitant AEDs did not differ between the responder and nonresponder groups. The final LEV dosage (4 months after LEV initiation) was significantly higher in the nonresponders (1,950±245.0 mg) than in the responders (1,142.9 ±225.9 mg) (P=0.001). 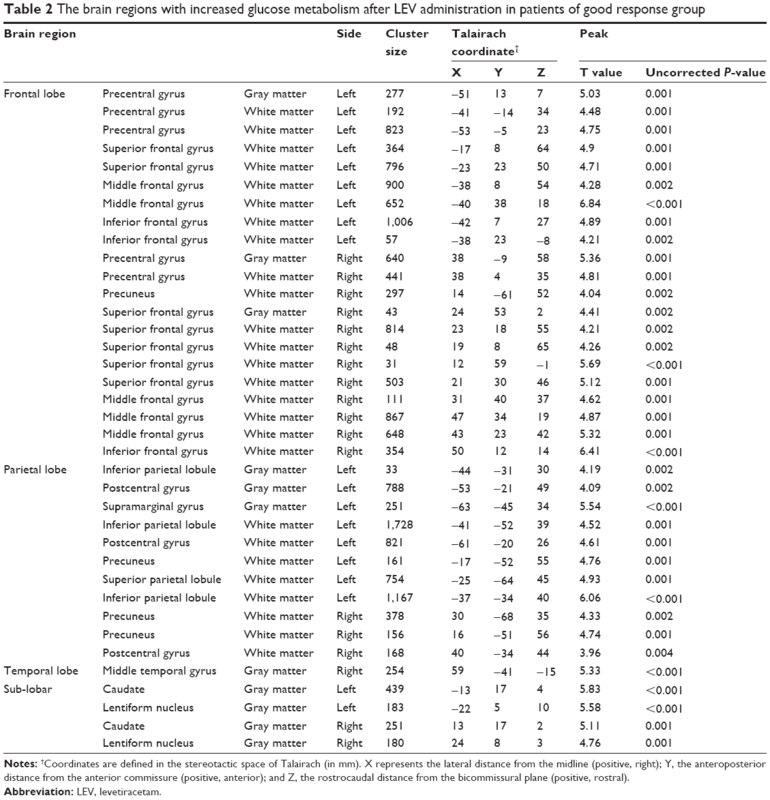 In the good response group, SPM analysis revealed a significant increase (P<0.005, uncorrected) in regional cerebral glucose metabolism in the bilateral frontal, caudate, and parietal areas following LEV administration (Figure 1; Table 2). There were no regions with significantly reduced glucose metabolism. In the poor response group, PET analysis did not reveal any significant changes in cerebral glucose metabolism after LEV treatment. 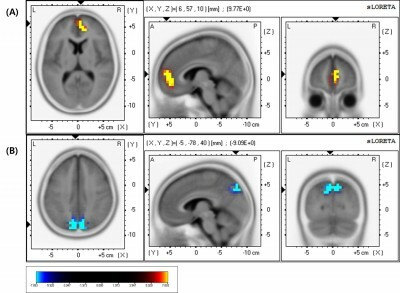 Figure 1 The brain regions showing increased glucose metabolism after levetiracetam administration in patients of the good response group (bilateral frontal, caudate nuclei, and parietal areas) assessed by SPM8. Note: Threshold: P<0.005, uncorrected for extent. Abbreviation: SPM8, Statistical Parametric Mapping (version 8). Notes: †Coordinates are defined in the stereotactic space of Talairach (in mm). X represents the lateral distance from the midline (positive, right); Y, the anteroposterior distance from the anterior commissure (positive, anterior); and Z, the rostrocaudal distance from the bicommissural plane (positive, rostral). In the good response group, there was a statistically significant (P<0.05) increase in the beta1 (13–22 Hz) relative power current density in the right medial frontal area (Figure 2A) and a significant (P<0.05) decrease in the delta (1–4 Hz) relative power current density in the medial parietal area (precuneus, Figure 2B) after LEV administration (Table 3). However, there were no significant changes in the poor responders. 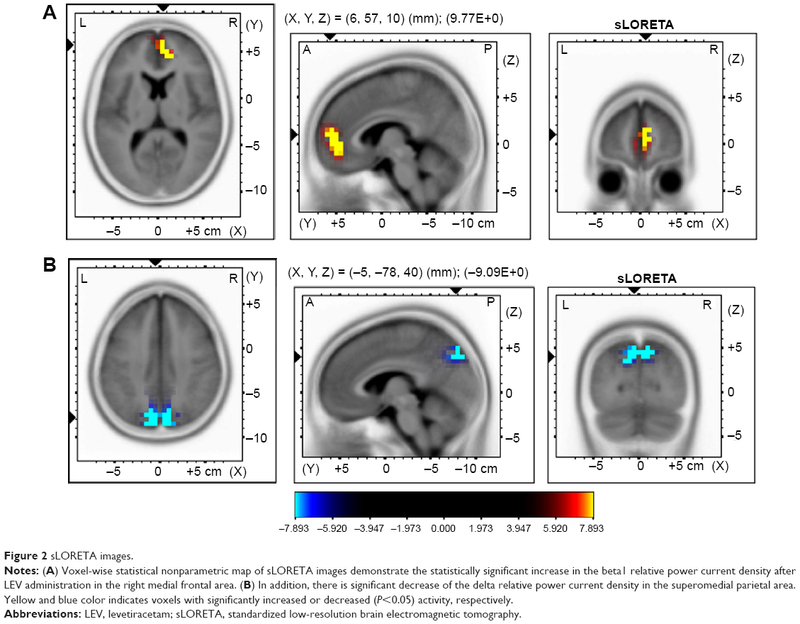 Notes: (A) Voxel-wise statistical nonparametric map of sLORETA images demonstrate the statistically significant increase in the beta1 relative power current density after LEV administration in the right medial frontal area. (B) In addition, there is significant decrease of the delta relative power current density in the superomedial parietal area. Yellow and blue color indicates voxels with significantly increased or decreased (P<0.05) activity, respectively. Abbreviations: LEV, levetiracetam; sLORETA, standardized low-resolution brain electromagnetic tomography. Note: All brain regions were thresholded at P<0.05. Abbreviations: BA, Brodmann’s area; LEV, levetiracetam; Lt, left; MNI, Montreal Neurological Institute; Rt, right. In the comparison of QOLIE-31 scores measured at baseline and 1 month after LEV initiation, no statistically significant changes were found in either group. Similarly, no differences in SCL-90-R scores were found between the two groups after LEV administration. We investigated the early effects of LEV administration on cerebral glucose metabolism and background EEG and the differences between good and poor responders. Furthermore, we evaluated the feasibility of predicting patients’ long-term responses to LEV based on these early changes. To the best of our knowledge, this is the first study to characterize differences in glucose metabolism and EEG activity during the early stages of LEV treatment in patients with focal epilepsy. Our results demonstrate that short-term LEV treatment enhances glucose metabolism and background EEG activity in good responders. 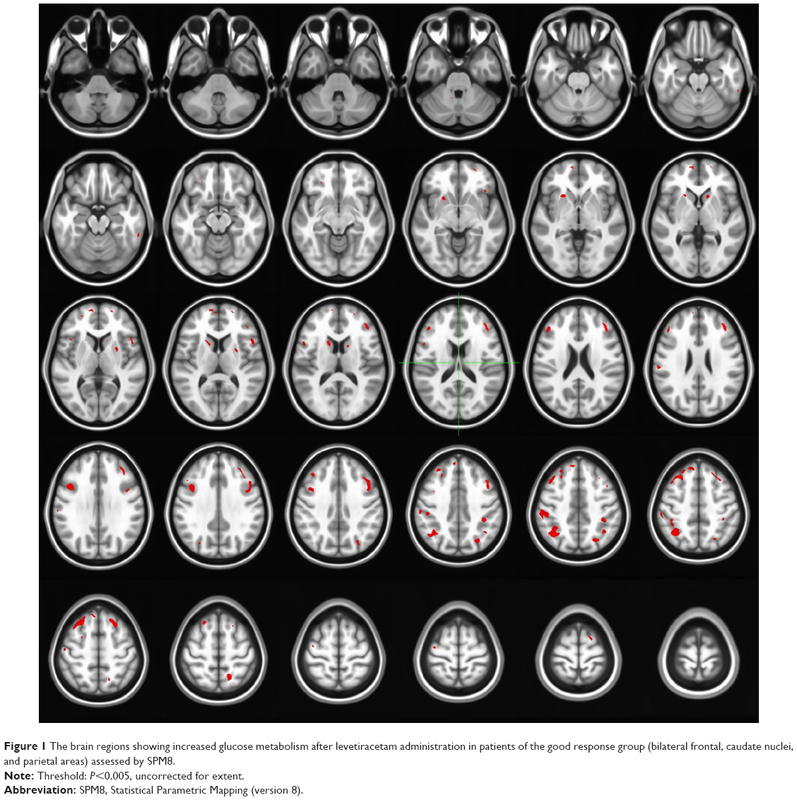 These patients showed increased glucose metabolism in the frontal and parietal regions, increased beta1 activity in the right medial frontal region, and decreased delta activity in the bilateral parietal regions. There were no statistically significant changes in the poor responder group. A number of studies have investigated the effects of AEDs on cerebral glucose metabolism and background EEG. Traditional AEDs such as phenytoin, carbamazepine, and phenobarbital may increase and decrease the power of slow and fast frequencies on background EEG, respectively.22,23 Carbamazepine increases the power of theta and delta bands but decreases the power of alpha bands.23 Valproate depresses cerebral glucose metabolism to a greater degree than does either carbamazepine or phenytoin, but to a lesser extent than observed for phenobarbital.4 These reports suggest that traditional AEDs have a negative influence on cerebral glucose metabolism and background EEG. In the present study, good responders continued to exhibit an excellent response to LEV 3 months following treatment, which suggests that it may be possible to predict the long-term effectiveness of LEV in individual patients based on 18F-FDG PET scans or background EEG patterns at an early stage of treatment. The SCL-90-R is a widely used self-assessment tool that assesses the subjective symptom burden of patients with various neuropsychiatric disorders such as epilepsy.30 Quality of life (QOL) is an important measure in epilepsy, a chronic, devastating condition that is unique due to its multidimensional effects on psychosocial functioning.31 A recent study of psychiatric symptoms and QOL in Korean patients with drug-refractory epilepsy receiving LEV reported improved psychiatric symptoms and QOL that were not related to seizure freedom after LEV. However, adverse events such as abnormal behavior, insomnia, anxiety, nervousness, and depression led to temporary LEV discontinuation by 5% of patients.32 Although we found no association between seizure reduction and an improvement in psychiatric symptoms or QOL, the study sample was very small, so the lack of a significant correlation may have been due to a type II error. There are several limitations to this study. First, the current study was performed in a relatively small number of subjects. Second, the data were obtained from a nonhomogenous population of de novo patients and those refractory to previous AEDs without an appropriate control group. A larger sample size and comparison with normal control subjects will provide additional insight into the effects of LEV on cerebral function. Third, the 3-month follow-up duration may not have been sufficient to determine the long-term effects of LEV treatment. Lastly, because no intensive neuropsychological testing was performed, the neurobiological findings from this study cannot be correlated with specific cognitive function domains. In conclusion, differences in the effects of LEV can be identified at an early stage of treatment in good and poor responders. These findings suggest that LEV-induced changes in glucose metabolism and EEG spectral activity may be differentiated based on initial responsiveness to the drug as early as 1 month after medication initiation. 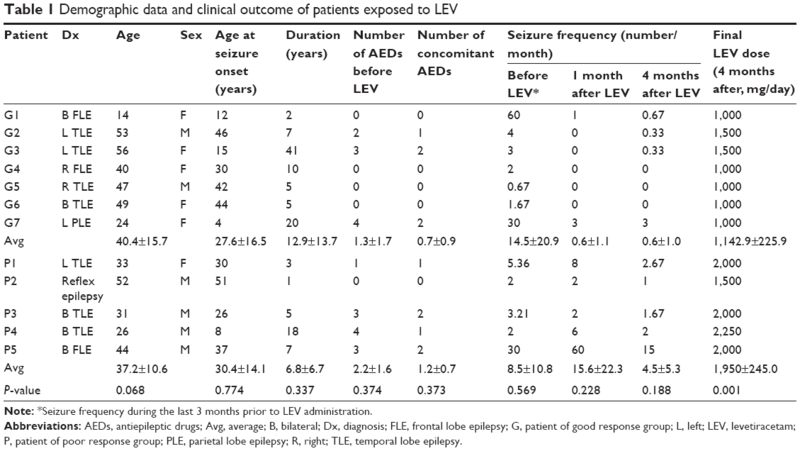 Thus, FDG PET scans and EEG data may be useful prognostic markers of the antiseizure effects of LEV or, at least, indicate the epiphenomena of changes in glucose metabolism and EEG frequency following seizure reduction by LEV. The results of this study indicate that LEV has positive effects in good responder patients and no negative effects in poor responder patients in terms of cerebral glucose metabolism and background EEG. Further studies with larger samples are warranted. This investigation was supported by UCB Korea Co, Ltd. Gratitude is expressed to UCB Korea Co, Ltd as well as the investigators and to their sites that provided patients for the study. We confirm that we have read the Journal’s position on issues involved in ethical publication and affirm that this report is consistent with those guidelines. Loring DW, Marino S, Meador KJ. Neuropsychological and behavioral effects of antiepilepsy drugs. Neuropsychol Rev. 2007;17(4):413–425. Ortinski P, Meador KJ. Cognitive side effects of antiepileptic drugs. Epilepsy Behav. 2004;5 Suppl 1:S60–S65. Witt JA, Alpherts W, Helmstaedter C. Computerized neuropsychological testing in epilepsy: overview of available tools. Seizure. 2013;22(6):416–423. Leiderman DB, Balish M, Bromfield EB, Theodore WH. Effect of valproate on human cerebral glucose metabolism. Epilepsia. 1991;32(3):417–422. Joo EY, Tae WS, Hong SB. Regional effects of lamotrigine on cerebral glucose metabolism in idiopathic generalized epilepsy. Arch Neurol. 2006;63(9):1282–1286. Joo EY, Tae WS, Han SJ, et al. The Effect of Topiramate and Lamotrigine on Cerebral Glucose Metabolism in Idiopathic Generalized Epilepsy Patients. Journal of Korean Epilepsy Society. 2005;9(2):129–136. Pascual-Marqui RD, Michel CM, Lehmann D. Low resolution electromagnetic tomography: a new method for localizing electrical activity in the brain. Int J Psychophysiol. 1994;18(1):49–65. Pascual-Marqui RD. Standardized low-resolution brain electromagnetic tomography (sLORETA): technical details. Methods Find Exp Clin Pharmacol. 2002;24 Suppl D:5–12. Doppelmayr M, Klimesch W, Stadler W, Pöllhuber D, Heine C. EEG alpha power and intelligence. Intelligence. 2002;30(3):289–302. Doppelmayr M, Klimesch W, Sauseng P, Hödlmoser K, Stadler W, Hanslmayr S. Intelligence related differences in EEG-bandpower. Neurosci Lett. 2005;381(3):309–313. Smith ME, Gevins A, McEvoy LK, Meador KJ, Ray PG, Gilliam F. Distinct cognitive neurophysiologic profiles for lamotrigine and topiramate. Epilepsia. 2006;47(4):695–703. Theodore WH, Bromfield E, Onorati L. The effect of carbamazepine on cerebral glucose metabolism. Ann Neurol. 1989;25(5):516–520. Park SP, Kwon SH. Cognitive effects of antiepileptic drugs. J Clin Neurol. 2008;4(3):99–106. Wright C, Downing J, Mungall D, et al. Clinical pharmacology and pharmacokinetics of levetiracetam. Front Neurol. 2013;4:192. Helmstaedter C, Witt JA. The effects of levetiracetam on cognition: a non-interventional surveillance study. Epilepsy Behav. 2008;13(4):642–649. Park SP, Kwon OY. Increased EEG current-source density in the high Beta frequency band induced by levetiracetam adjunctive therapy in refractory partial epilepsy. J Clin Neurol. 2009;5(4):178–185. Cho JR, Koo DL, Joo EY, et al. Effect of levetiracetam monotherapy on background EEG activity and cognition in drug-naïve epilepsy patients. Clin Neurophysiol. 2012;123(5):883–891. Mazziotta J, Toga A, Evans A, et al. A probabilistic atlas and reference system for the human brain: International Consortium for Brain Mapping (ICBM). Philos Trans R Soc Lond B Biol Sci. 2001;356(1412):1293–1322. Lancaster JL, Woldorff MG, Parsons LM, et al. Automated Talairach atlas labels for functional brain mapping. Hum Brain Mapp. 2000;10(3):120–131. Jurcak V, Tsuzuki D, Dan I. 10/20, 10/10, and 10/5 systems revisited: their validity as relative head-surface-based positioning systems. Neuroimage. 2007;34(4):1600–1611. Nichols TE, Holmes AP. Nonparametric permutation tests for functional neuroimaging: a primer with examples. Hum Brain Mapp. 2002;15(1):1–25. Duncan JS, Smith SJ, Forster A, Shorvon SD, Trimble MR. Effects of the removal of phenytoin, carbamazepine, and valproate on the electroencephalogram. Epilepsia. 1989;30(5):590–596. Besser R, Hornung K, Theisohn M, Rothacher G, Krämer G. EEG changes in patients during the introduction of carbamazepine. Electroencephalogr Clin Neurophysiol. 1992;83(1):19–23. Joo EY, Tae WS, Kim JH, Han SJ, Kim BT, Hong SB. Effect of Topiramate on Cerebral Glucose Metabolism. Journal of Korean Epilepsy Society. 2004;8(2):116–122. Salinsky MC, Binder LM, Oken BS, Storzbach D, Aron CR, Dodrill CB. Effects of gabapentin and carbamazepine on the EEG and cognition in healthy volunteers. Epilepsia. 2002;43(5):482–490. Neufeld MY, Kogan E, Chistik V, Korczyn AD. Comparison of the effects of vigabatrin, lamotrigine, and topiramate on quantitative EEGs in patients with epilepsy. Clin Neuropharmacol. 1999;22(2):80–86. Mecarelli O, Piacenti A, Pulitano P, et al. Clinical and electroencephalographic effects of topiramate in patients with epilepsy and healthy volunteers. Clin Neuropharmacol. 2001;24(5):284–289. Marciani MG, Stanzione P, Mattia D, et al. Lamotrigine add-on therapy in focal epilepsy: electroencephalographic and neuropsychological evaluation. Clin Neuropharmacol. 1998;21(1):41–47. Rausch R, Henry TR, Ary CM, Engel J Jr, Mazziotta J. Asymmetric interictal glucose hypometabolism and cognitive performance in epileptic patients. Arch Neurol. 1994;51(2):139–144. Wiebe S, Rose K, Derry P, McLachlan R. Outcome assessment in epilepsy: comparative responsiveness of quality of life and psychosocial instruments. Epilepsia. 1997;38(4):430–438. Cramer JA, Perrine K, Devinsky O, Bryant-Comstock L, Meador K, Hermann B. Development and cross-cultural translations of a 31-item quality of life in epilepsy inventory. Epilepsia. 1998;39(1):81–88. Lee JJ, Song HS, Hwang YH, Lee HW, Suh CK, Park SP. Psychiatric symptoms and quality of life in patients with drug-refractory epilepsy receiving adjunctive levetiracetam therapy. J Clin Neurol. 2011;7(3):128–136.